A Wild start to the season after bringing home the full two points in the opening game and a positive start to the campaign with goals from five different players. The Wild were able to ice an almost full squad with Joshua Benstead and George Crawshaw missing for the first game of the season away to Coventry. The improvements made over the summer have been significant within the open five minutes Captain Shaun Dippnall making a good attempt at goal which started a serious of shots forcing Blazes starting net-minder into pressure. 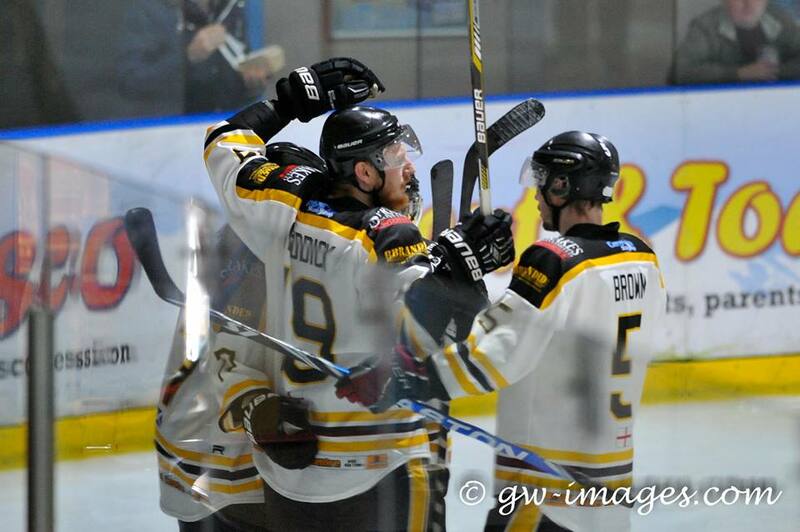 The pressure prevailed for the Wild as Pavel Vales scored assisted by Scott McKenzie and Geoff Wigglesworth. Soon after mistakes were made in defence giving Blaze a golden opportunity but didn’t take it with Wild still leading 1-0. With many shots coming from all sides of the rink, long shot from Ben Brown for then Coventry Blaze to counter that with their own shots. The first penalty of the night was awarded to Wild’s Lee Kemp for tripping with seven minutes left in the first period. Less than five minutes left Blaze started to pick up the tempo as did Wild to match the pace with yet another serious of low shots then a rebound out to Kieran Strangeway on the blue line still yet to double their lead. Expectantly Blaze looked to be a threat in the closing stages so much so sending Brett Robinson to the sin bin for the remaining of the first. The Buzzer sounded for the end of the first with Wild leading 1-0 going into the second. The opening of the second for Wild was full of achievement: although both sides had unsuccessful shots of the puck until Scott McKenzie triumphed after so many attempts to double the lead final came when Pavel Vales passed to McKenzie who then lifted the puck from a long shot and pass wide of the keepers glove into the back of the net. Danny Bullock extended that lead with another goal assisted by Michal Fico to make it 3-0 Wild. For Wild’s newbie Michal Fico finally kicked started his season with his name on the score-sheet extending the Wild’s lead even further ahead to 4-0 with still 15 on the clock in the second. Wild came close so many times with Strangeway, Wigglesworth, Brown hitting the post sending the puck wide of the net, the Wild looked very dangerous with seven left till regulation, Vales secured his second goal of the night with Kieran Strangeway assisting. Blaze had their fair share opportunities with the desire to put one away into the net but still yet to come even with the change of their keeper, they couldn’t break the defence down or add pressure to Greg Ruxton. Blaze in the third came back out on to the ice strong and in positive spirit with some big hits and a few chances at goal, but failed to infiltrate the Wild defence. The sixth goal was made just shy of four minutes into the last period McKenzie slides the puck to Shaun Dippnal who then slipped it low past the keeper. The last section of the game mainly Blaze’s net minder were put through their paces with Wild’s Ruxton made just as many saves, shortly before full time Blaze had one of few golden opportunities but failed again to ruin Wild’s hard earn clean sheet. With chances at both ends of the rink almost end two end, at the final buzzer Wild walked away with six goals netted and a clean sheet. MVP given to Blaze’s second net-minder number 30 Renny Marr, while MVP for the Wild was given to number 84 defence-man Tom Jackson. An exciting start to the season with the first home game next weekend against Deeside Dragons.